Ballybunion bared her fangs for the first time this week but Ireland’s Des Smyth bit back to card a roller-coaster, two under par 69 that left him just two strokes behind England’s Roger Chapman after the opening round of the €350,000 Irish Seniors Open. “The beauty about Ballybunion is that it gives you opportunity to make birdies and eagles,” said Smyth, who had an eagle and five birdies as well as three bogeys and a double bogey six on his card. 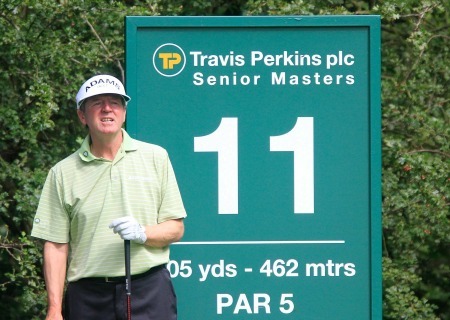 The 56-year old is renowned far and wide as a wind specialist and while he was far from happy with his iron play, he was delighted to take advantage of his chances on a day when several big names saw their title hopes blown off course. Last season’s Order of Merit winner Ian Woosnam was level par with two holes to play but bogeyed the 17th and then twice tangled with the rough at the crosswind 18th before three putting from no more than ten feet for a double bogey six and a three-over par 74. Eamonn Darcy shot 74 and Scotland’s Sam Torrance a five over par 76 while Cork’s Denis O’Sullivan had three double bogey sixes in a six-over par 77 that leaves him ten strokes behind Chapman. Tied for second place with Sweden’s Per-Arne Brostedt, Argentina’s Horacio Carbonetti and English pair Andrew Murray and Glenn Ralph, Smyth hit a hat-trick of birdies from the fourth to race to three under par. But he bogeyed the sixth and seventh and then followed a birdie at the ninth with a double bogey at the 11th and a bogey at the 12th to slip to one-over par before digging deep on the homeward stretch. It took an eagle three at the 13th, where he hit a 175-yard seven iron to a foot, to put the spring back in his step and he then chipped and putted for another birdie at the par-five 16th to post a 69 that was a little too adventurous for his liking. A member of the 1981 Walker Cup side that featured Ronan Rafferty and Philip Walton, Chapman proclaimed himself “very, very happy” with a 67 that featured two eagles, three birdies and three bogeys. Playing in just his third event since he joined the senior ranks on May 1, he certainly has plenty of power at his disposal. While Smyth hit a driver and a seven iron to the downwind 13th, Chapman used a three-wood and a gap wedge to set up an easy, two putt birdie and needed just two four-irons and a ten foot putt to eagle the 499-yard 16th. Still, he’s not getting ahead of himself and believes he will face a serious challenge from wind specialists of Smyth's calibre over the weekend. Ireland's Des Smyth crafted a three-under par 68 to take and one-shot lead into the final round of the Irish Seniors Open at Ballyliffin. England’s Peter Mitchell edged one step closer to winning his second European Seniors Tour title when he carded a fine five under par 67 to move into a slender one shot lead after the second round of the Scottish Seniors Open over the East course at Marriott Dalmahoy Hotel & Country Club near Edinburgh. Des Smyth had to settle for third place as England’s Peter Mitchell withstood a strong challenge from Scotland’s Sam Torrance to win his second European Seniors Tour title of the season at the Scottish Seniors Open over the East course at the Marriott Dalmahoy Hotel & Country Club near Edinburgh. Des Smyth suffered a nightmare finish to see his chances of winning the Irish Seniors Open blown away in the wind at Ballybunion.